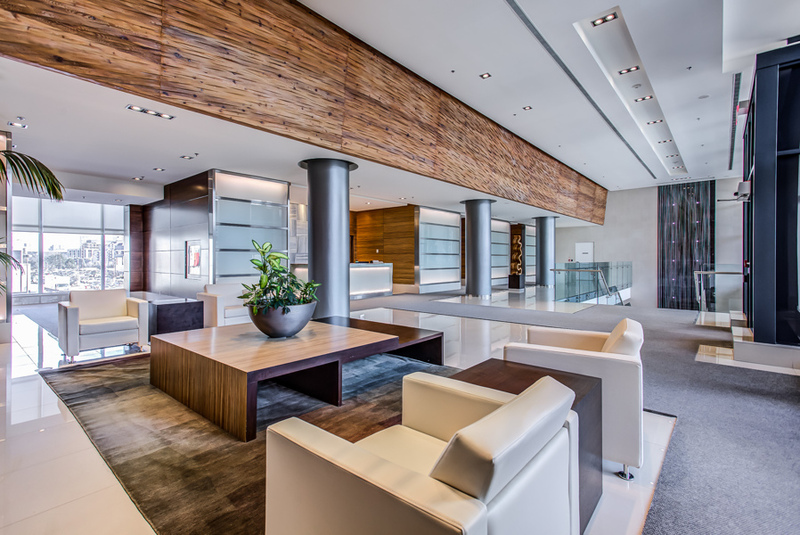 The common area lobby is a striking blend of natural and artificial elements. Arc Condos is located at the intersection of Bayview and Sheppard in upscale North York. 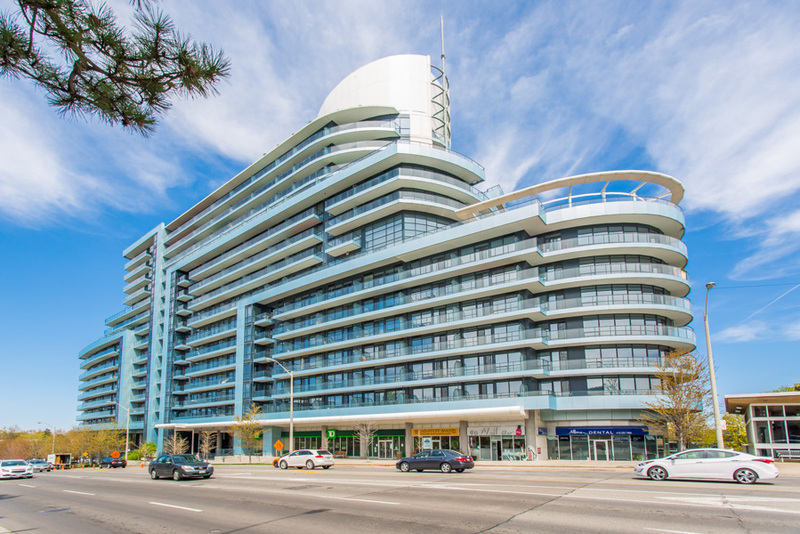 At 15-storeys, the mid-rise condo is distinguished by its unique curvilinear design and pale blue-green glass windows. Even the staircase is modern and edgy, combining sharp contours, geometric shapes and a 2-storey waterfall! Together with abundant amenities and elegant interiors, Arc Condos offers residents the best of Toronto (minus the noise and congestion). 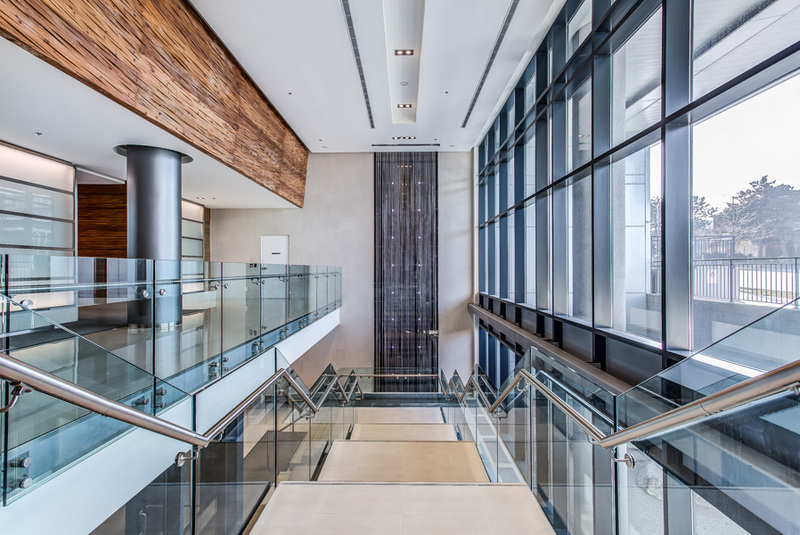 The condo’s unusual design gives it a greater sense of space. 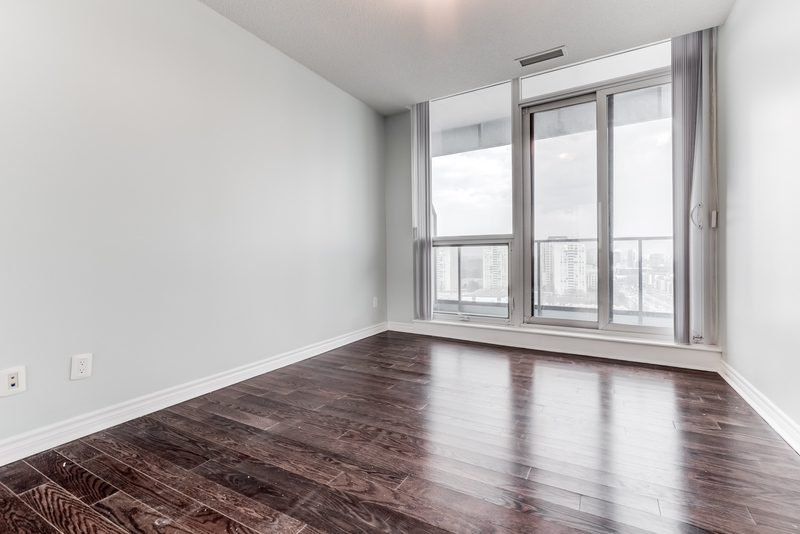 Unit 1106 consists of 1 large bedroom, 1 washroom, and a massive 249 sq. ft. balcony. An open-concept layout links the living, dining and kitchen areas. At the same time, high-ceilings, arching walls, and huge floor-to-ceiling windows create the impression of unending space. These windows provide limitless views and sunlight. Gray walls add a touch of tranquility, while glassy hardwood floors reflect incoming light, making everything seem brighter. This kitchen comes with a view. 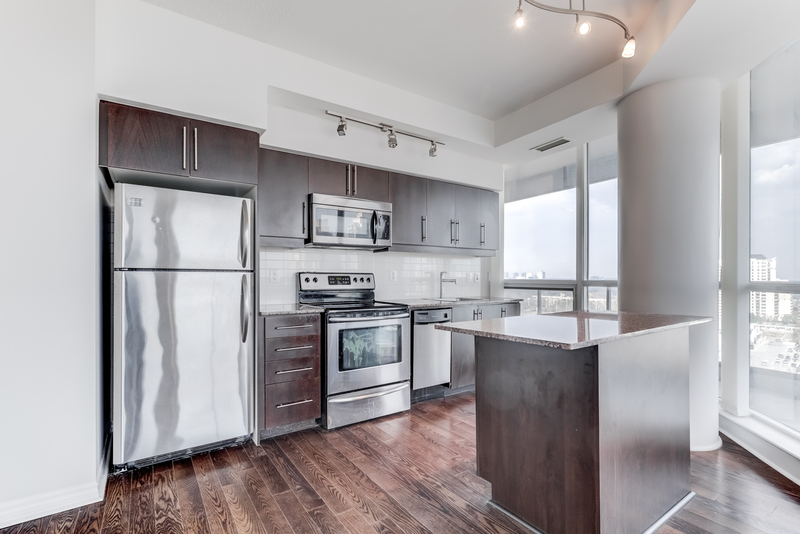 Unit 1106’s kitchen has all the right ingredients: granite counters, track-lighting, plenty of storage, a breakfast bar, and recessed appliances. Since the appliances are built into the walls, there’s no loss of space. 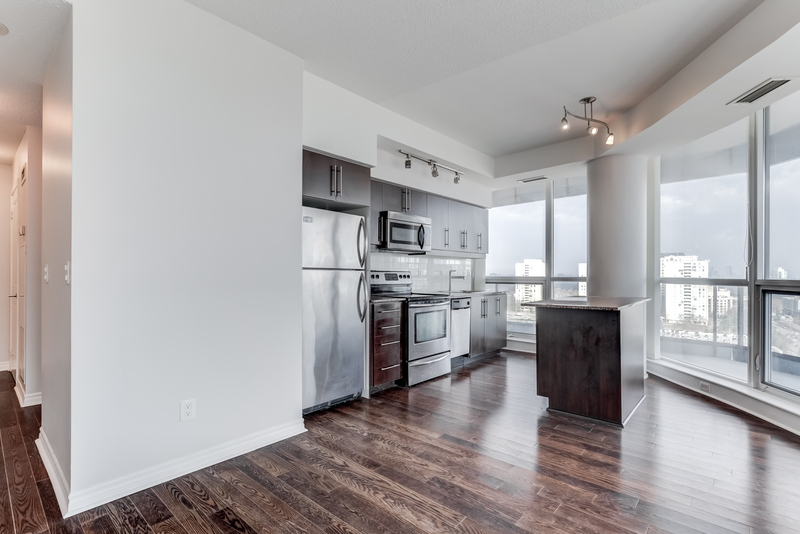 Plus, the lovely breakfast bar offers residents a sweeping view of North York, making every meal worth savoring. 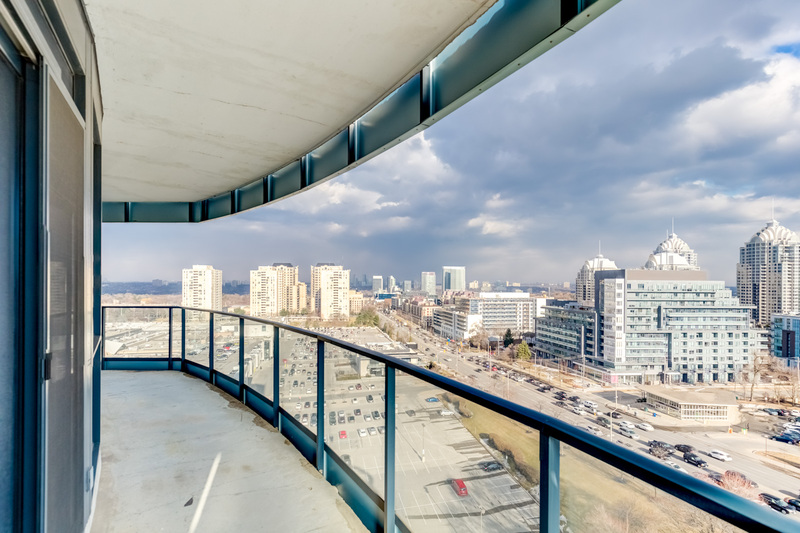 See North York from the comfort of your bedroom, or simply step out onto the balcony. The master bedroom is incredibly spacious and serene, with lustrous hardwood floors and rich gray walls. It also has a large closet for all your storage needs and walk-out balcony access. The ensuite bathroom is beautiful yet functional, using contrasting whites and browns to arrest the eye. 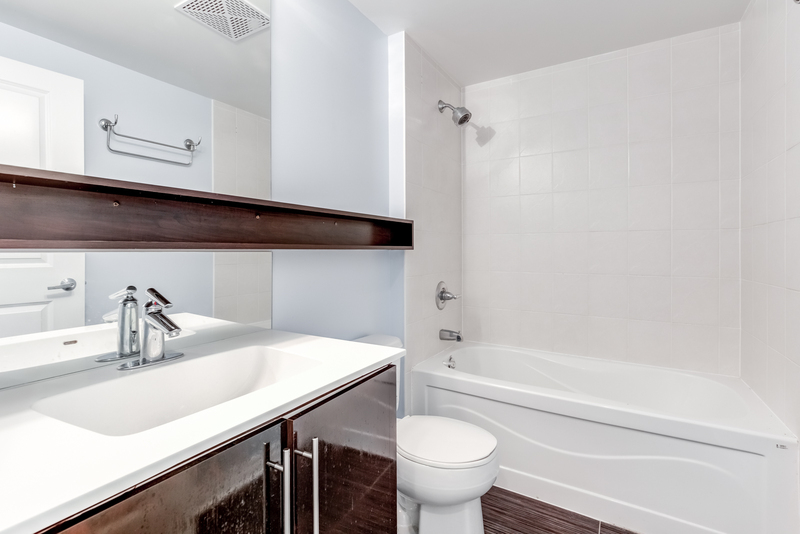 Unit 1106’s washroom delivers practical storage in the form of floating shelves and under-sink cabinets. It also features a shower, tub, extra-wide vanity, and an enormous mirror that stretches all the way to the ceiling. 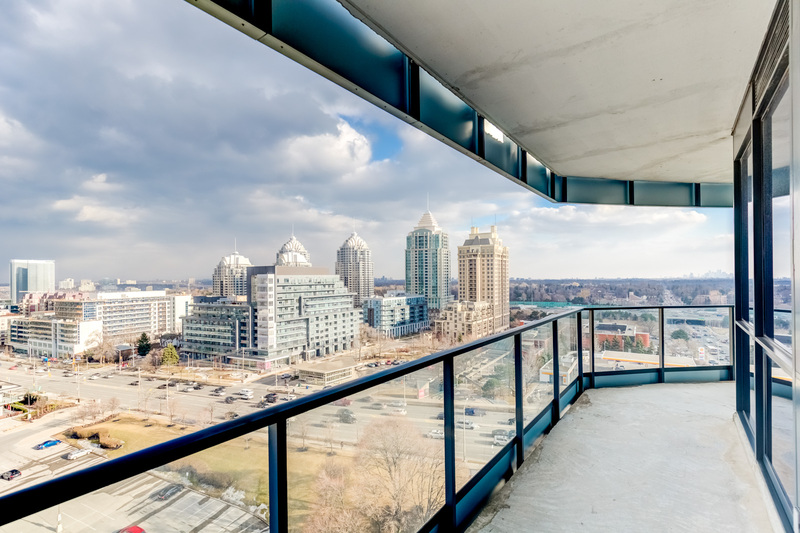 Arc Condos has one of the best views in all of North York. Not only does it wrap-around the corners (or rather curves) of the building, it also boasts transparent glass panels. 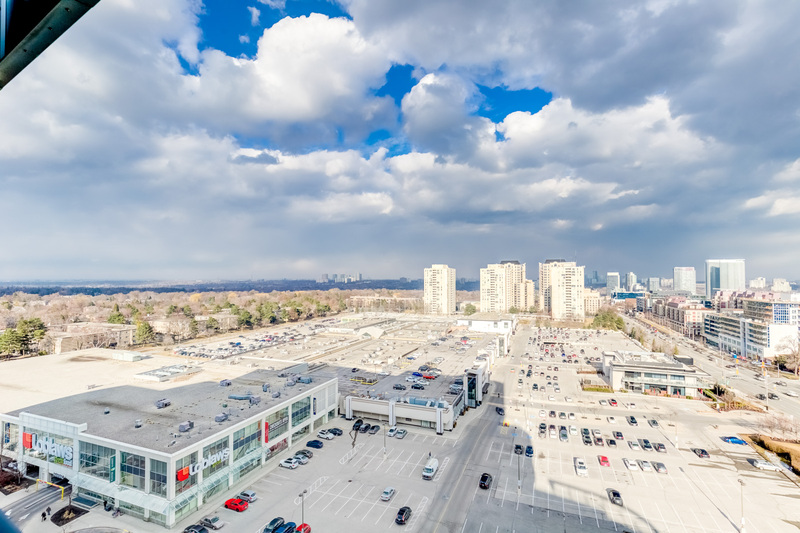 These crystal-clear panels add to the gorgeous panorama that is North York. And because the balcony is so huge, there’s more than enough space to entertain guests. 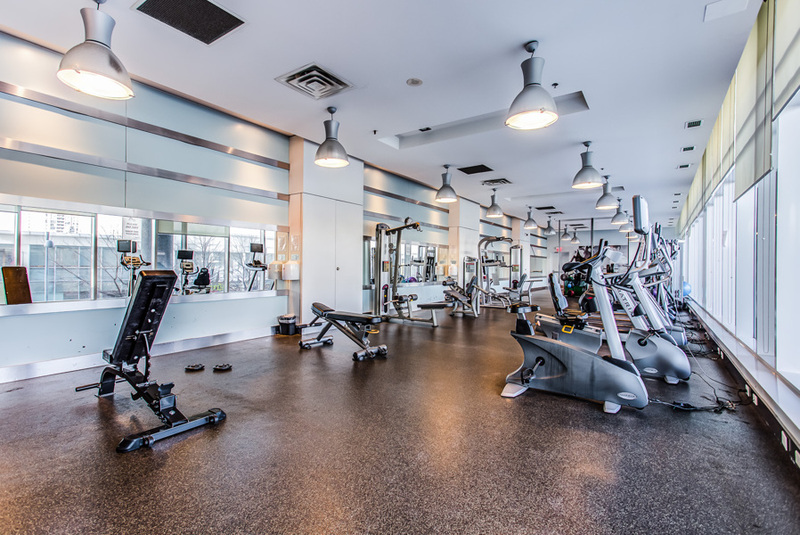 Why pay for a gym membership when you have access to a state-of-the-art facility? Done working out? 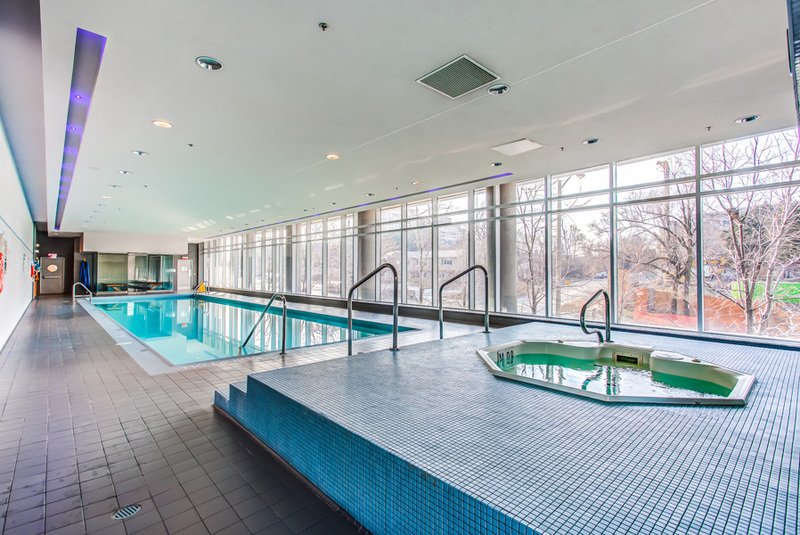 Head over to the whirlpool for a relaxing dip. 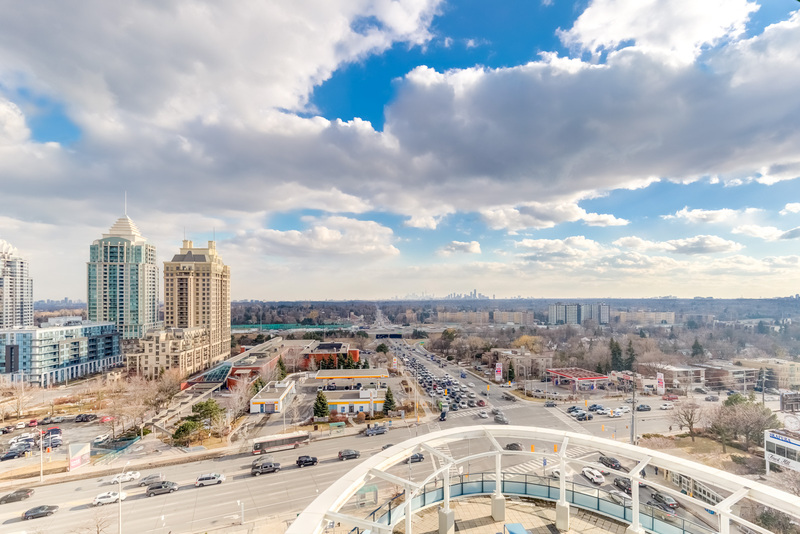 North York—as seen from Arc’s rooftop deck. 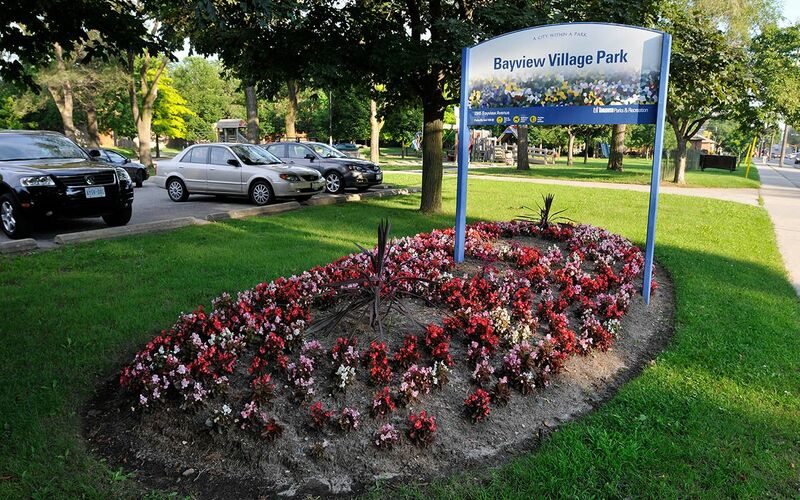 There’s so much to love about Bayview Village, starting with the fact that it’s not downtown Toronto. That means you can avoid the rush and stress of downtown living, while benefiting from amazing shops, restaurants, services and entertainment. 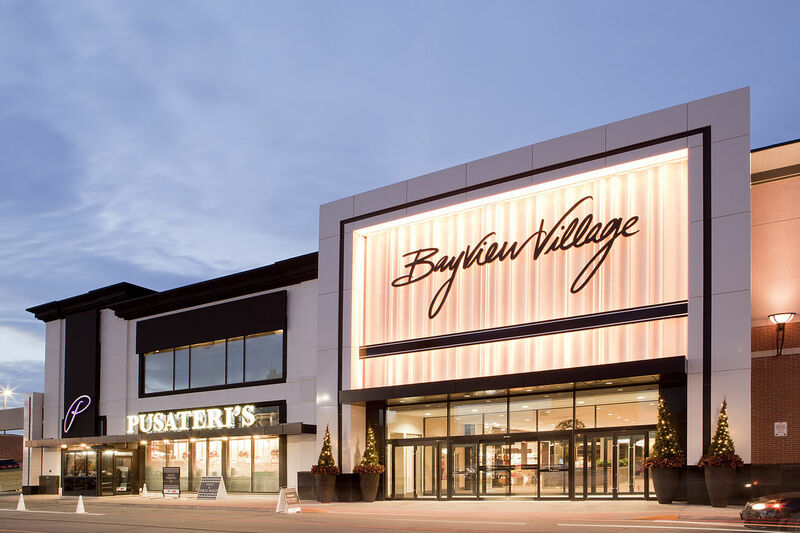 And it’s all conveniently found at the Bayview Village Shopping Centre—your one-stop shopping destination. With over 110 retailers, the 440,000 sq. ft. mega-mall has everything you need, including fashion, jewelry, home décor, toys, gifts, floral arrangements and more. Worried about food? Don’t be. The mall is home to gourmet restaurants, cafes, dessert shops, juice bars, a Loblaws, and an LCBO. Loblaws is literally a stone’s throw from 2885 Bayview Avenue (depending on how hard you throw). In addition to retail, the shopping complex also offers vital services. For example, you’ll find several major banks, a doctor’s clinic, a post office, a pharmacy and six dentist’s offices. There’s also numerous hair salons, dry cleaners, a spa and even a branch of the Toronto public library. 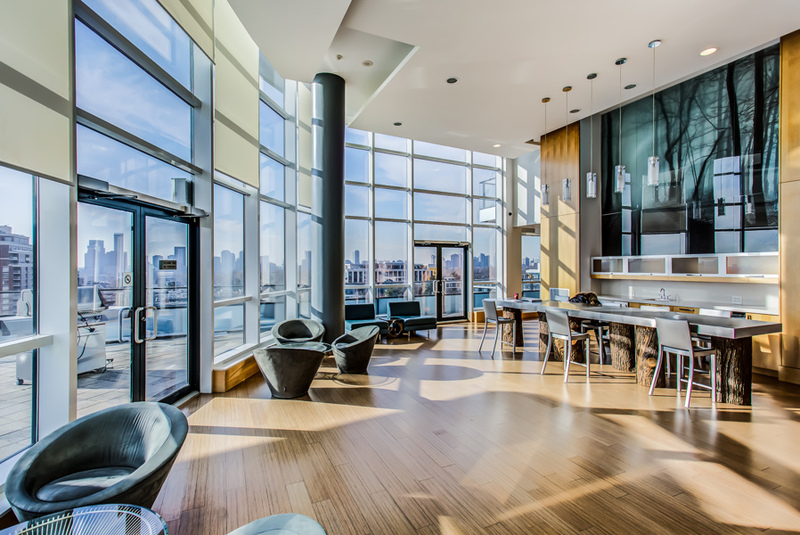 Arc Condos has a rooftop deck with restaurant-style seating, tables and outdoor BBQs. 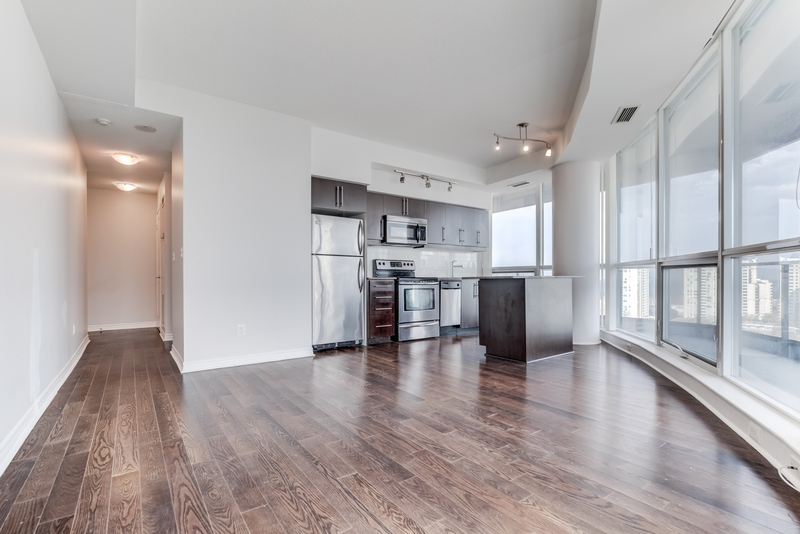 Everything from Unit 1106’s gorgeous rooms, curvilinear design and amazing amenities set it apart. Then there’s its proximity to the Bayview Village Shopping Centre. Retail, restaurants, groceries and essential services—2885 Bayview brings it all to your doorstep. 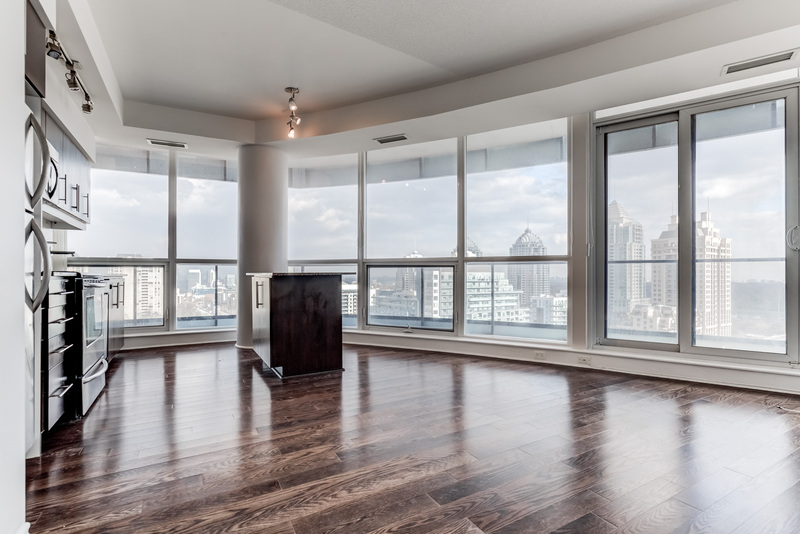 Want to know more about 2885 Bayview? Take the Virtual Tour or contact me below for more details.